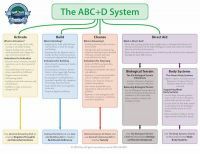 The ABC+D Charts overview the entire ABC+D System of health consulting. These 13 beautifully designed, full-color charts are printed on heavy cardstock paper and spiral bound. They cover the ABC+D System, the six tissue state model of biological terrain and the eleven body systems. Aromatherapy for Emotional Healing, focuses on the outstanding properties of essential oils to help shift emotional states. In this chart Steven covers the eight vital qualities of essentials and the problems they overcome and mapped out how they relate to 16 different fragrance qualities and their energetic actions based on the Oriental model of yin and yang, the Western four element model (air, water, fire and earth). It also lists which essential oils will help with the 12 emotional energy centers. Make it easier for you to use emotional healing techniques to help your clients heal emotionally with these two charts. The first chart, Aromatherapy for Emotional Healing, focuses on the outstanding properties of essential oils to help shift emotional states. In this chart Steven covers the eight vital qualities of essentials and the problems they overcome and mapped out how they relate to 16 different fragrance qualities and their energetic actions based on the Oriental model of yin and yang, the Western four element model (air, water, fire and earth). It also lists which essential oils will help with the 12 emotional energy centers. 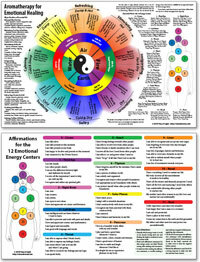 The back of the chart covers the fragrances, qualities and basic effects on mind and mood of 46 major essential oils. These include all of the single essential oils from NSP and many of the essential oils in NSP’s blends. The second chart, Essential Tools for Emotional Healing, focuses on the other two tools for emotional healing that Steven has found to be effective, flower essences and question affirmations. One side of the chart will help you use question affirmations to clear issues from each of the twelve emotional energy centers. The other side covers over 100 different flower essences that can be used to open up those energy centers with inpidual indications for each flower essence. Essential Tools for Emotional Healing, focuses on the other two tools for emotional healing that Steven has found to be effective, flower essences and question affirmations. One side of the chart will help you use question affirmations to clear issues from each of the twelve emotional energy centers. The other side covers over 100 different flower essences that can be used to open up those energy centers with individual indications for each flower essence. This full color chart is one of the finest iridology charts I’ve seen. It has the same look and feel as Dr. Jensen’s original chart, but adds important zones missing on Dr. Jensen’s original chart, such as the heart zone in the right iris, the pancreatic area in the left iris, and the parathyroid area next to the thyroid zone.